Now that it’s feeling more like fall, I’m ready to start using my oven for more than just baking. We haven’t had pork in a long time and I couldn’t pass up the sale at Giant last week. Buy one pack, get one free – I mean really, who can’t pass that up! 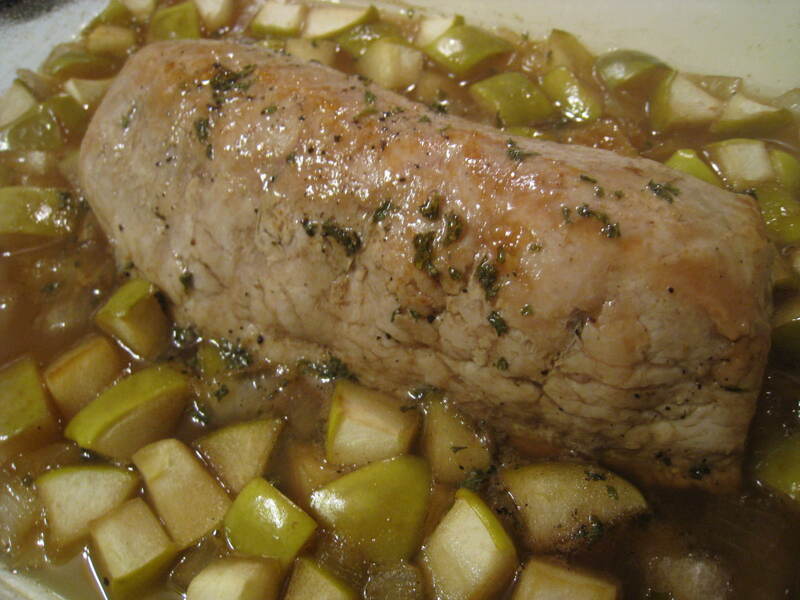 I usually just pan saute pork tenderloin but wanted to find a new recipe and found this one from allrecipes.com. I change the recipe slightly and it turned out great. In a large skillet, heat olive oil over mediume heat. Brown the pork tenderloin on all sides. Remove from pan and place in baking dish. Season all sides with salt, pepper and dried parsley. In the same skillet, saute onions and apples for 5 minutes until onions soften and become translucent. Add the apple juice and deglaze the pan. Bring to a boil and then add around the pork in the baking dish. In a small bowl, mix the apple jelly and balsamic vinegar until there are no lumps. Spread over pork. Bake for 30-45 minutes until pork is cooked. Let rest 10 minutes before slicing.